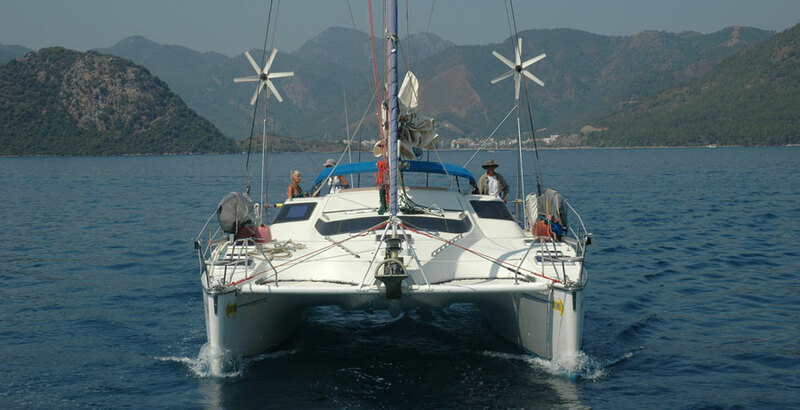 CATAMARAN VOYAGES AROUND THE WORLD. 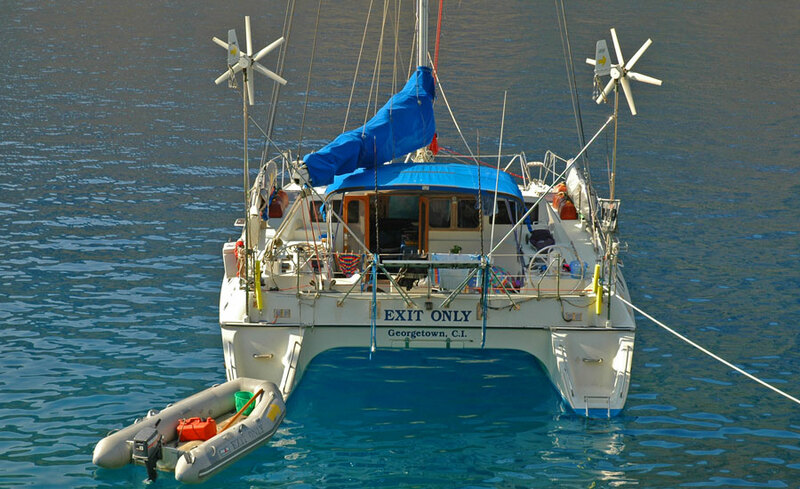 JOIN THE CREW OF EXIT ONLY AS THEY SAIL AROUND THE WORLD. 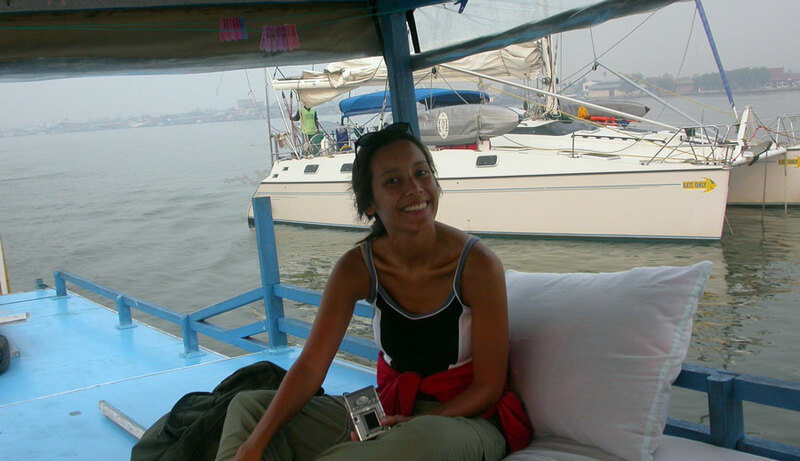 Sailing to Borneo was never on my to do list. It's not that I didn't want to go there. I just never considered it as a sailing destination. Life is full of pleasant surprises, and Borneo turned out to be one of them. The other name for Borneo is Kalimantan. Both of them sound like exotic destinations, and it's cool to be able to say that you sailed your yacht to Borneo or Kalimantan. 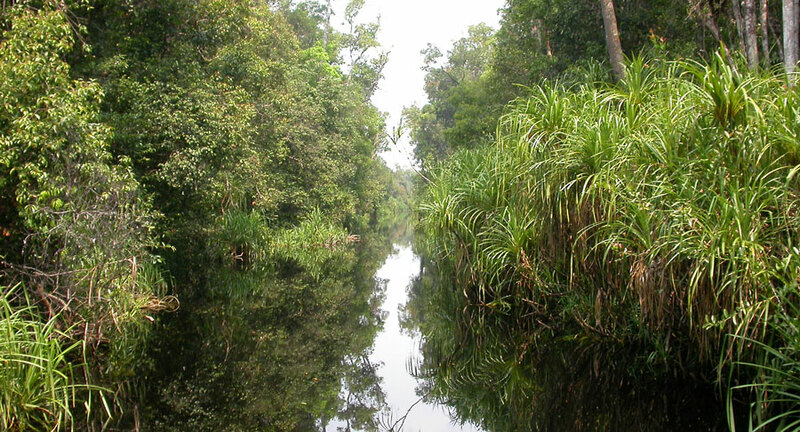 What's even better is to travel up the Kumai river and have a look at the endangered Orangutans in the wild. Borneo is off the beaten path and sailing there on your own yacht is a big deal. It's not around the corner and up the street. 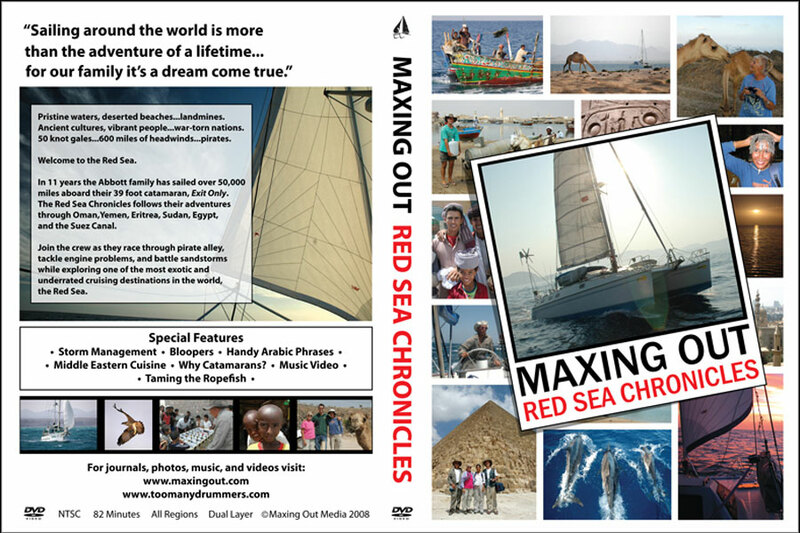 It's your reward for a long hot passage across the Java Sea. 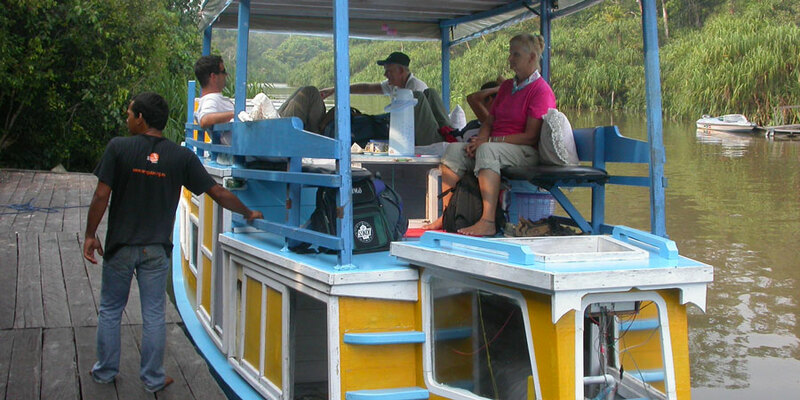 In order to see the endangered Orangutans, you must sail up the Kumai river which takes the better part of a day if all goes well. Sometimes things don't go well, and you run aground. That's exactly what happened to the sailboat that traveled with us up the Kumai river. 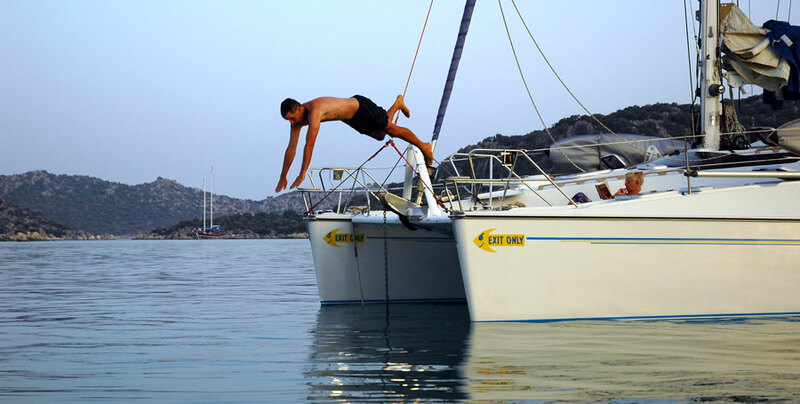 We only draw about four and a half feet, but the keel boat draws more than six. The water at the entrance of the river is full of sandbars and shallow mud, and the channel is not well marked. We relied on cruising directions from other cruisers to navigate the river's entrance. Unfortunately, something got lost in translation, and the sailboat ran aground. They tried every trick in the book to get free, but they could not do it on their own. Finally a shallow draft fishing boat came to their rescue. With two crew members sitting out on the end of the boom to heel the sail boat over, the underpowered fishing boat was able to tow them off the sandbar. The hardest part of getting up the Kumai River is its entrance, and that's because we didn't know the location of the channel. There aren't any buoys to mark the channel entrance. Later in the day we saw big passenger ships navigating the river, and they obviously had local knowledge that kept them from running aground. Once we were several miles past the entrance, we easily navigated the wide river, and we arrived at the town of Kumai before dark. 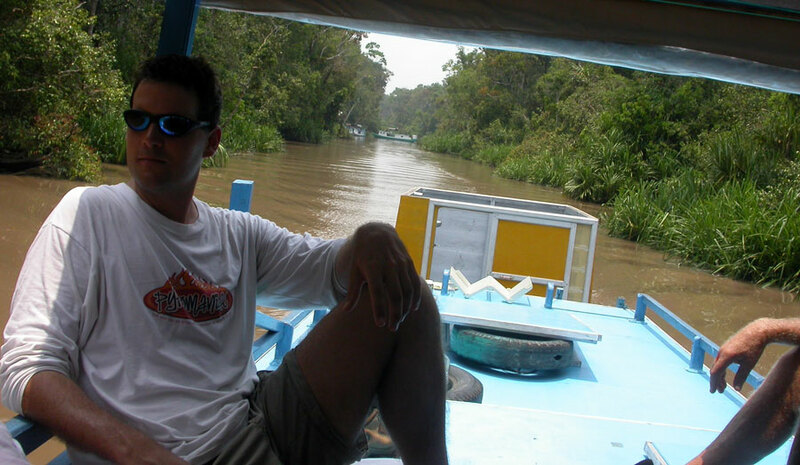 Shortly after dropping our anchor, a boat pulled alongside to ask if we wanted a jungle tour to see the wild Orangutans. They could do a long day trip or an overnighter depending on how much money we wanted to spend. We didn't want to leave Exit Only overnight without us on board, and so we opted for the long day trip that would run from sunrise to just after sunset. For our crew of four people, the total cost was $100. That included meals which were basic, but safe to eat. Borneo has a problem with deforestation from loggers, and to make matters worse, forest fires turn the sky grey from all the smoke. 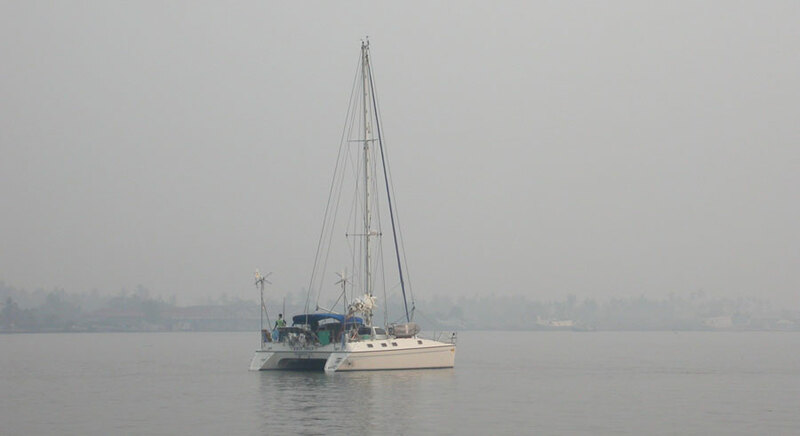 Exit Only sits quietly at anchor in Kumai with the town obscured in smoky haze. It's hard to imagine how much smoke there is in the air. You have to see it to believe it. 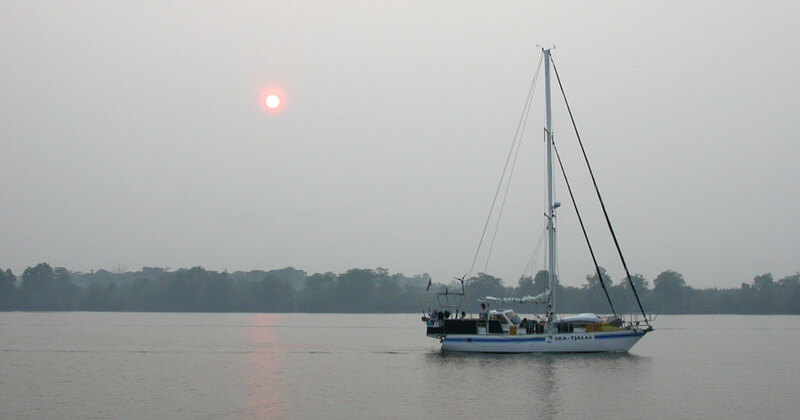 The first sign of our arrival on the Borneo coast was the sun blotted out by all the smoke. It appeared as a tiny pale ball in the smoky sky. The tour boat arrived on schedule after sunrise, and the crew of Exit Only hopped on board ready for an excellent adventure. Sarah managed to muster a smile in spite of the early hour. When the tour boat picked us up, they deposited one of their employees on board Exit Only to tend the boat in our absence. We left him a snack and plenty of water, and our tour hosts told us that he would give the boat a wash while we were away. We traveled a couple of miles down the Kumai river and then turned east into one of its tributaries. 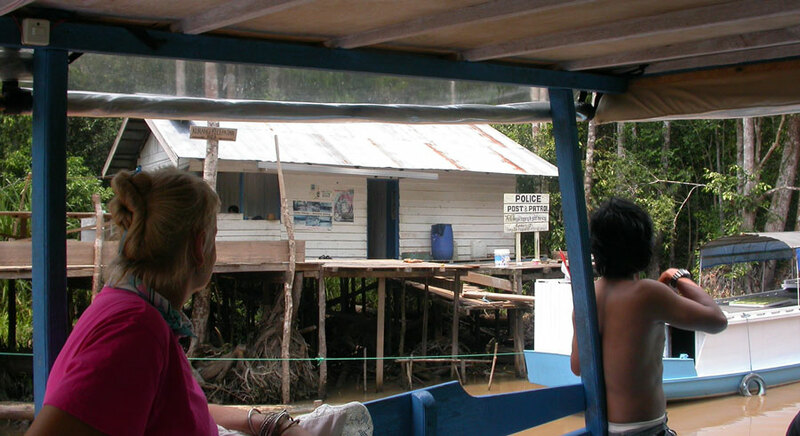 We would be traveling on this side river for half a day to reach our destination - Camp Leaky and the wild orangutans. The river starts out muddy, but by the time we reach its headwaters, the river is crystal clear except for tannin staining the water so that it looks like clear tea. 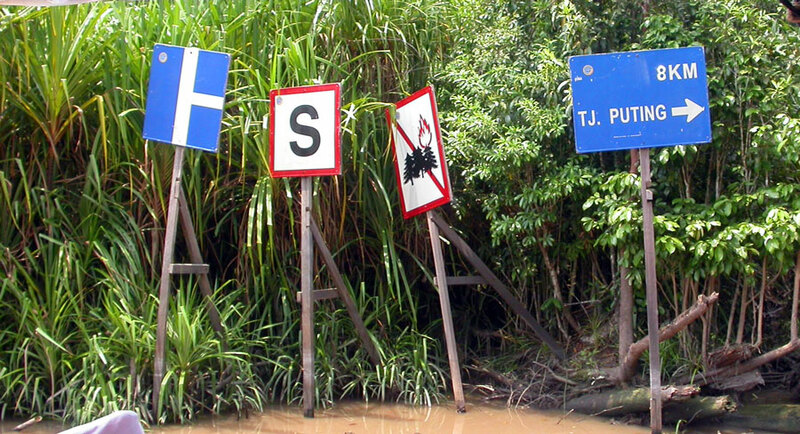 The river is actually a highway in the Jungles of Borneo. Water highways need signs just like roads on land, and as you head upstream there are lots of signs to guide you safely to your destination. There's plenty of river traffic, some fast and some slow. 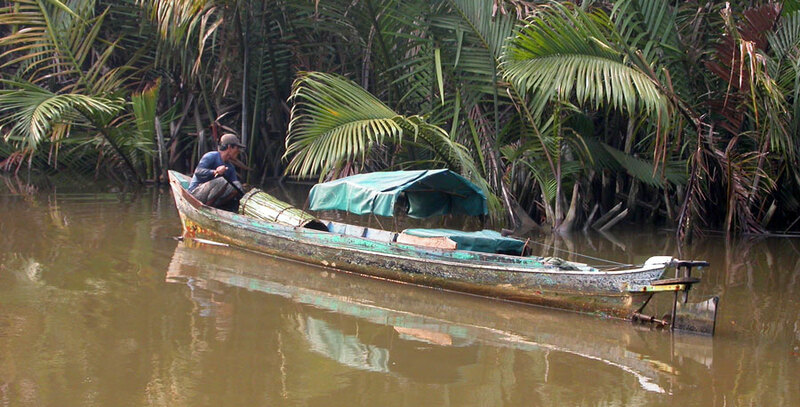 Young people in speed boats like to go fast even in the jungles of Borneo. David sits on his perch surveying the landscape as we journey up river. 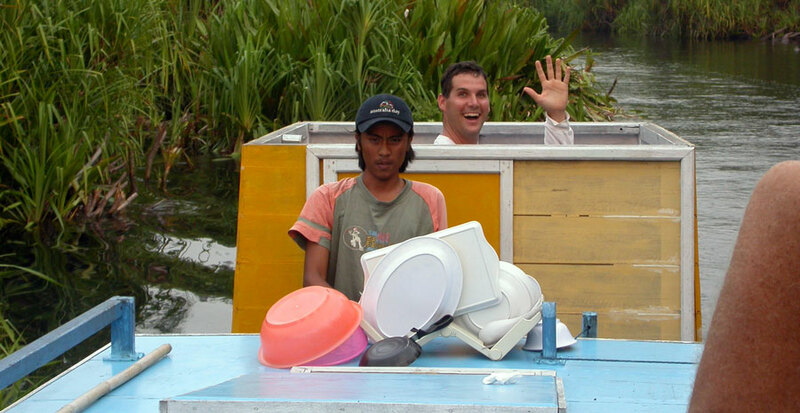 The yellow rectangular box on the back of the boat is the head (bathroom) for when mother nature calls. All manner of wildlife lives in the trees along the river with monkeys and birds in abundance. These folks are paddling upriver to their home along the riverbank. Their traditional canoe has plenty of freeboard to haul their cargo to and from market. This fisherman inspects the water along the riverbank. He has a small inboard engine and outboard rudder to extend his range on the river. Home is where your heart is, and these young people have converted their boats into floating homes. 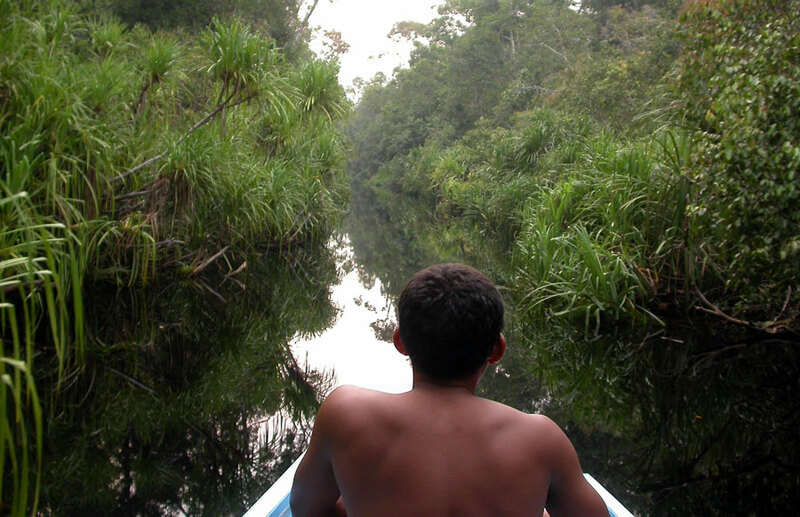 As you sail up river, it appears that jungle surrounds you on all sides, but appearances are deceiving. You come to places where it's obvious that deforestation reigns supreme. Deforestation is a big problem for the Orangutans because it destroys their habitat, and without habitat, they cannot survive in the wild. We are traveling upstream on the "Spirit of the Forest." That's a good name for a boat that depends on the rainforest for survival. 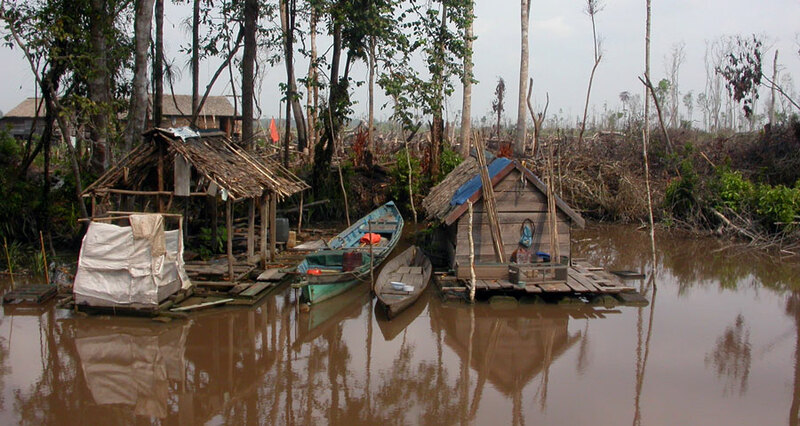 When the rainforest disappears, the orangutans will disappear, and the boat will disappear as well. Of course, they could give deforestation tours for the few tourists that would come. 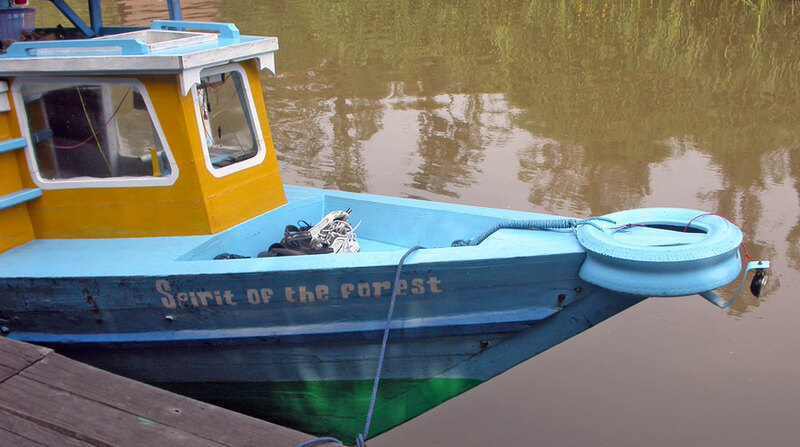 The "Spirit of the Forest" is a long shallow draft riverboat. It wouldn't be any good offshore, but for motoring up the narrow rivers it's ideal. Donna, David, and Sarah from Exit Only relax on the observation deck of our riverboat. Further upstream, a police station stands on elevated posts. 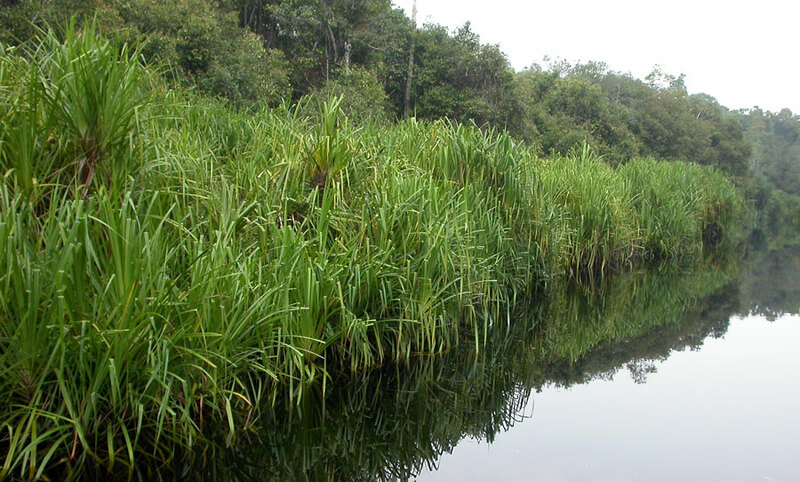 It isn't much, but it's all they have to protect this endangered part of the rainforest. 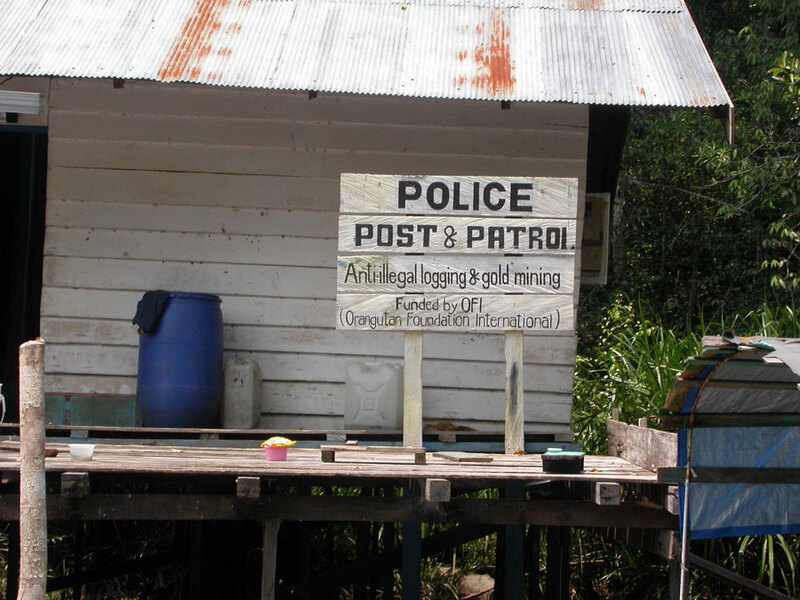 This police post wouldn't be here without funding from the Orangutan Foundation International. Logging and gold mining interests would drive the Orangutan into extinction if they had their way. The further you head upstream, the narrower and shallower the river becomes. It's now obvious why these riverboats are so narrow and why they have such shallow drafts. The water no longer has a muddy brown appearance. It is crystal clear and has the color of tea from tannin leached into the water. The water is so still in this pristine river that the surrounding jungle reflects in its mirror-like surface. 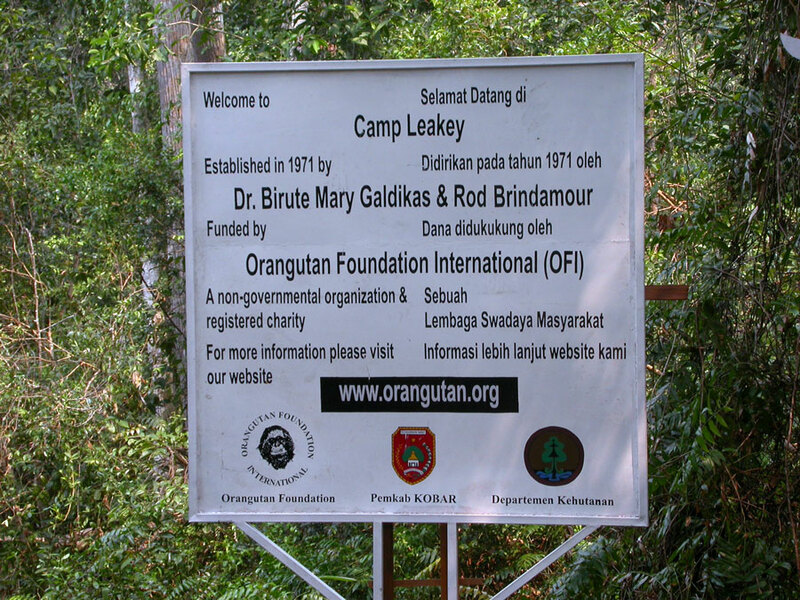 We finally arrive at Camp Leaky funded by the Orangutan Foundation International. This is where you get up close and personal with the orangutans. But you don't want to get too close, because these are wild animals. They could pull your arms out of your arm sockets if they wanted to. 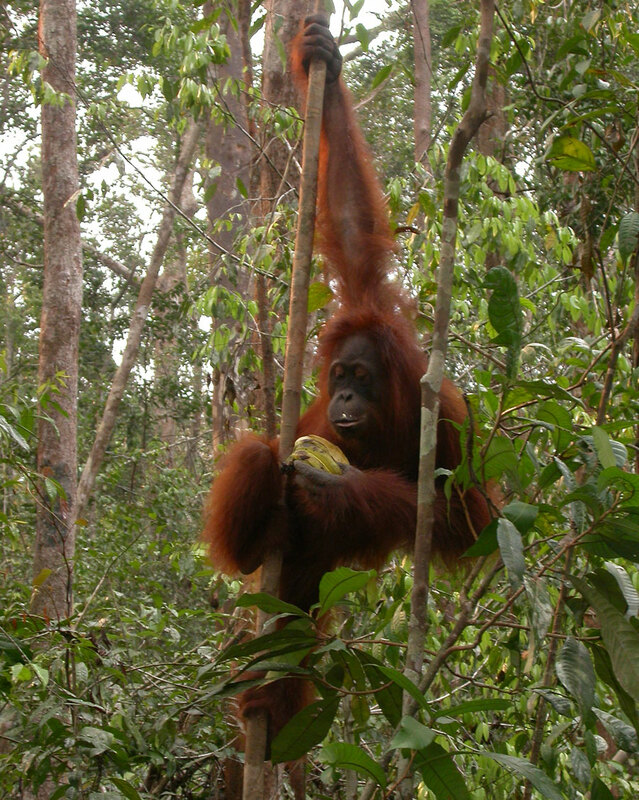 You can learn more about Camp Leakey by visiting their website at Orangutan.org. This cage is a great idea. 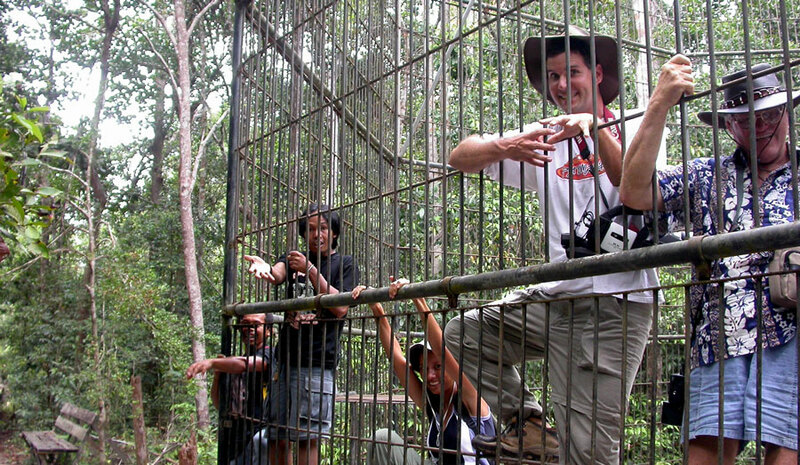 If we could put all the illegal loggers, illegal gold miners, the destroyers and the developers in this cage, the orangutans would be safe. 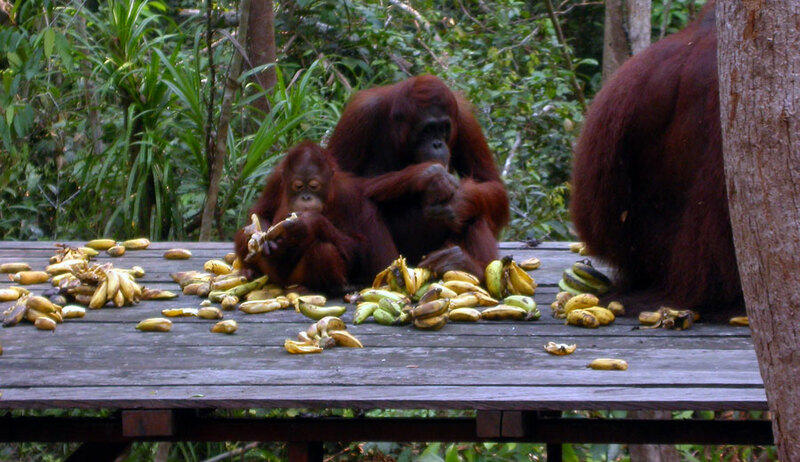 On this feeding platform, a large male orangutan eats bananas with a mother and baby orangutan close by. This mom and baby are unafraid, but don't let that fool you. These are wild animals, and they can hurt you. Mother and child are strolling around the feeding platform. Baby orangutans nurse from their mothers even while hanging in the trees. Did you ever wonder what an orangutan nest looks like? Look at the dark nest in the trees. Now you have seen one. 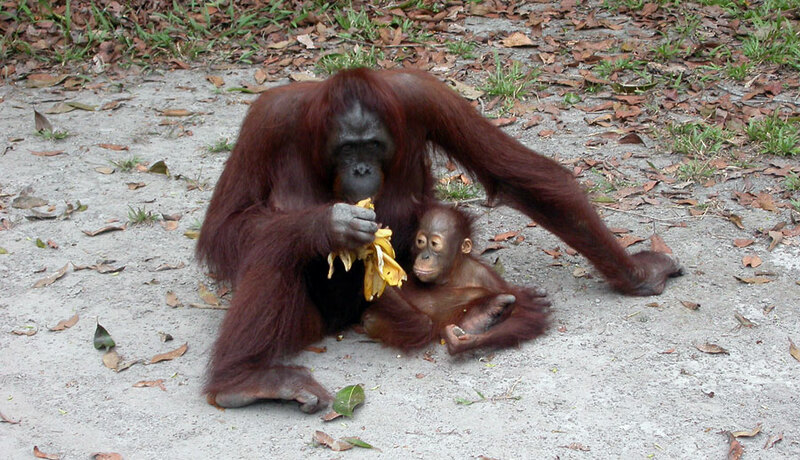 Orangutans look like they are mostly arms and legs. 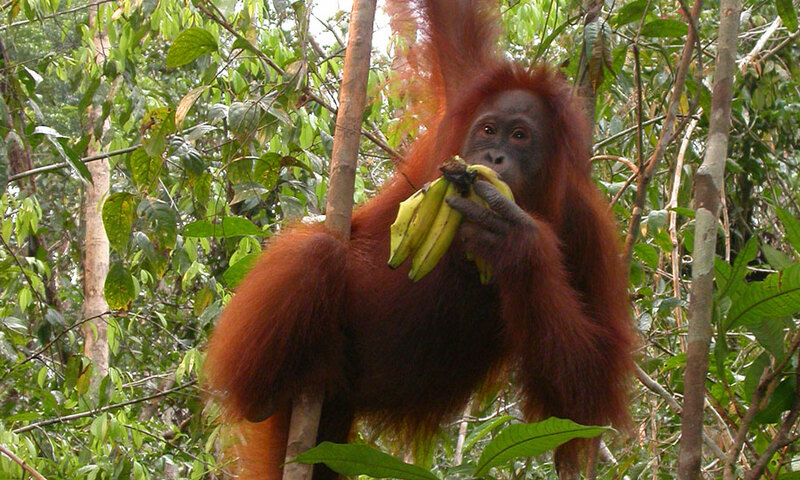 This fellow likes bananas and has no trouble eating them with one hand while hanging from trees and vines. This orangutan is a dominant male named Win. 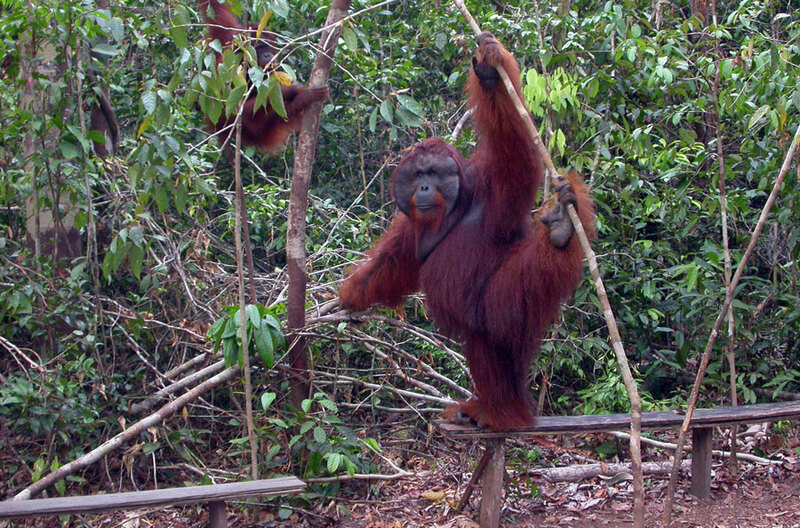 He is displaying to the other males in the area letting them know that he rules this section of the jungle. 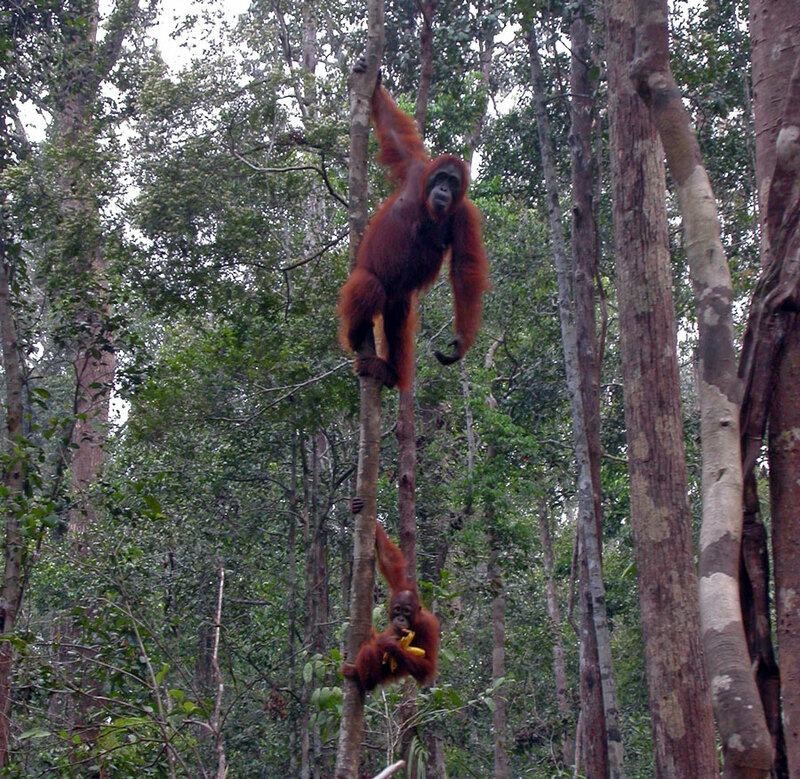 The guides said he was agitated by the fact that there were other males in the canopy with the female orangutans. They told us to give Win an extremely wide berth, because at the moment he was not a happy male orangutan. In spite of that warning, a Japanese photographer got very close to Win, and we wondered what was going to happen. The large orangutan did not attack the unwise photographer, but he really pushed his luck. The word "stupid photographer" keeps popping up in my mind. 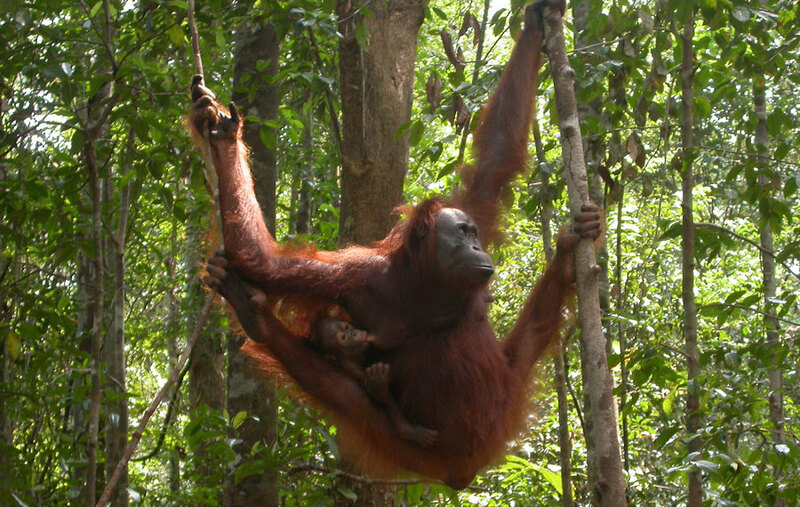 Mother and baby are hanging out together in the jungle. I was jealous of the orangutans with their large arms and legs. They move effortlessly through the jungle canopy while I trudge along the ground. Animals are made for wild places, and zoos are their prisons. We punish them for crimes that we commit. We destroy their habitat, and then we try to save them by locking them up in zoos. David tests the head (restroom) to see if it works as advertised. Our captain navigates the "Spirit of the Forest" downstream into the smoky twilight. 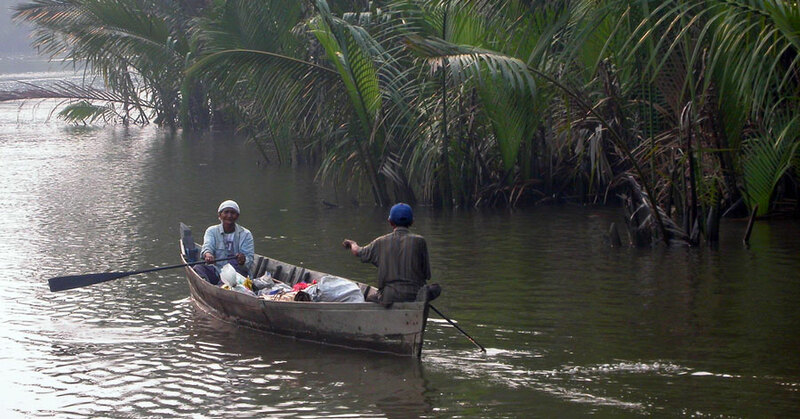 We leave Kumai the next morning heading downstream on the Kumai river and out into the Java sea. 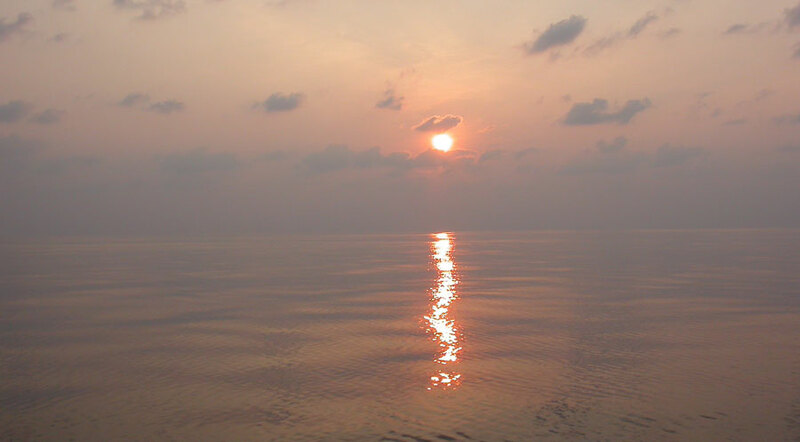 It's another smoky Borneo sunrise on the Java sea. 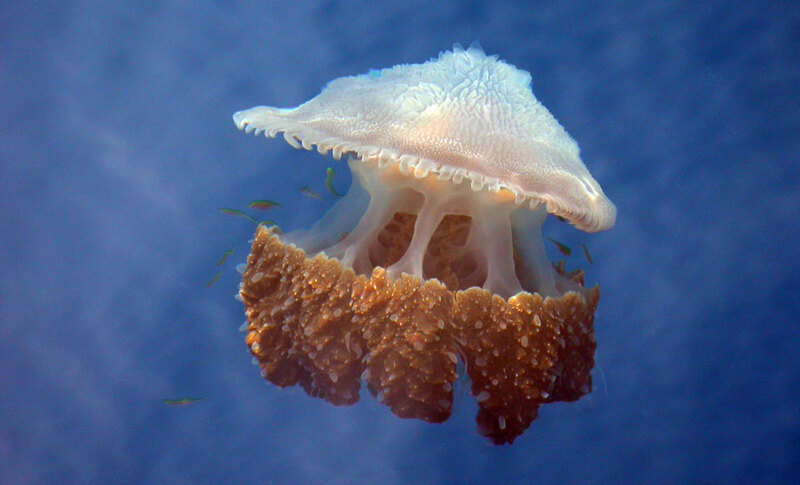 Back on the windless Java sea, the water is so calm that you can take pictures of large jellyfish as you motor north on the way to Singapore. 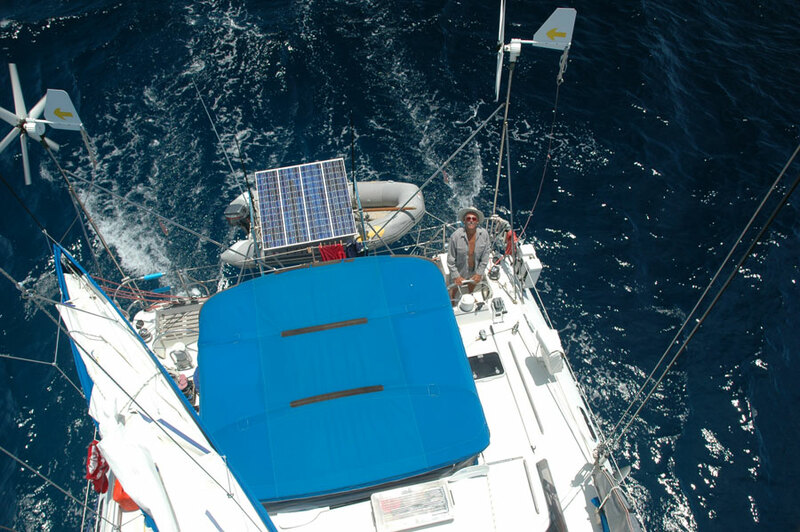 Click on this button to tell your friends about Catamaran Voyages.